Stephen Sondheim and James Lapine’s macabre and hilarious twist on the fairy tales that you think you know will have you laughing and leaping out of your seat in equal measure! With its beautiful and haunting score and hilarious script, ‘Into the Woods’ really is a modern classic of musical theatre. Recently a critically acclaimed motion picture starring Meryl Streep, the young performers of Key Youth Theatre (KYT) are eager to go ‘Into the Woods’ to bring you this triumph of storytelling back to its roots in the live and intimate environment of the Key auditorium. 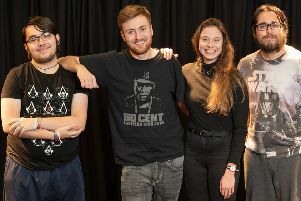 KYT’s production team of director Paul Crosby, choreographer Lisa Collings and Musical Director Steve Hession will once again be at the helm for what promises to be the must see show of the summer. Tickets are already selling faster than ever so book early to avoid disappointment. The show runs from Wednesday 19 to Saturday, August 22 at 7.30pm (plus 2.30pm Saturday matinée). Tickets are £15.50, £12 concessions every evening performance with the matinée just £14, £11.50 concessions. To book tickets, call the Box Office on 01733 207239.